In the previous procedure, you saw how reducing the number of colors compromised details in the illustrations. Specifically, by reducing the number of colors from 128 to 32, several animal silhouettes changed color and some animals disappeared altogether because the new color assigned to them was also the color assigned to the background behind them. You'll now learn how to lock specific colors to ensure that those colors do not drop out of the reduced palette. 1 In the magnification pop-up menu of the image window, select 100% so that you can see most of the image. 2 In the Optimization palette, change the Colors value back to 128. 3 Select the eyedropper tool (/ ), and click the camel silhouette in the African Savannah area to sample that color. The dark brown color is selected in the Color Table palette. 4 Click the Lock button ( Ij ) at the bottom of the Color Table palette to lock the selected color. A small square appears in the lower-right corner of the color swatch, indicating that the color is locked. Note: To unlock a locked color, select the color swatch and then click the Lock button again. 5 Using the eyedropper tool and the Lock button on the Color Table palette, select and then lock the dark blue color of the bear silhouette in the Northern Wilderness area. 6 In the Optimize palette, reduce the number of colors to 32. Notice that the locked colors remain in the palette after the reduction and in the image. However, new color-shift problems appear: The trail in the Northern Wilderness area is now the same color as its background, and the Tropical Rainforest animals are now brown instead of dark green. 7 In the Optimize palette, change the number of colors back to 128. 8 Again using the eyedropper and the Color Table Lock button, select and lock the colors of the parrot in the Tropical Rainforest and both the trail and background colors in the Northern Wilderness. You now have five locked colors. 9 In the Optimize palette, set the colors to 32. If you experiment with optimization of image files, you'll notice that significant image degradation can occur when the palette is reduced below 32 colors. 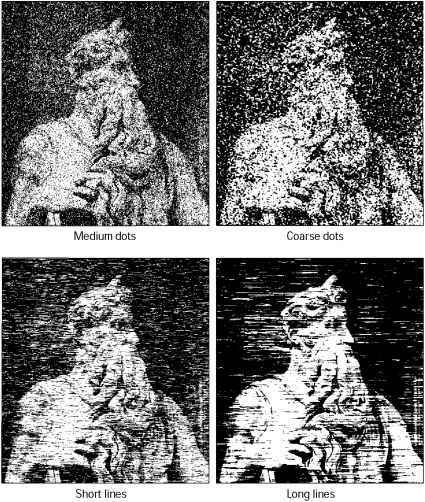 In fact, for all but the simplest images, even 32 colors may be too drastic a reduction. For the best file compression of a GIF image, try to use the fewest number of colors that will still display the quality you need. » For an illustration of the image set to different palette values, see figure 14-1 in the color section.